Aaliyah woke up and looked over at her bed to find it empty. Groaning, she got up and got ready for her day. She loved being pregnant, but it was a pain trying to move around with something permanently altering your sense of space and depth. As she left her bedroom and walked towards the sound of men shouting, she had to smile. Spending time with all her family was something she had missed and Antonio was having a blast with Bem and Aaron around. “You boys better take it down a notch, if Rae hears you she’ll make you watch Good Luck Charlie with her all morning!” Aaliyah laughed as she watched the horror dawn on Bem and Aaron’s faces, while Antonio smiled. Leaving them with that threat, she walked into the kitchen to prepare some breakfast for her and Rae. Today was an important day, Rae was six years old and Aaliyah’s mother planned a huge celebration. It was a little nauseating to think of all the people her mother had invited, half of whom were dignitaries and politically important people. This was going to be a nightmare. Aaliyah turned around to see Rae holding an ice cream cone. “Rae, seriously? It’s nine in the morning! You know better and I’m cooking you breakfast!” Aaliyah scolded Rae. Rae just shrugged. “But it’s my birthday,” she said and walked into the dining room. Shaking her head, Aaliyah turned around to continue making pancakes. “Some kids don’t even get breakfast…at least it wasn’t deep fried,”Aaliyah mumbled while she plated her breakfast. Sitting down next to Rae, Aaliyah quickly ate her breakfast. When she was almost done, she felt little arms wrap around her from behind. “I love you mommy.” Rae hugged Aaliyah and kissed her on the cheek. Rae ran out of the room after that and Aaliyah got up to clean up and get ready for the rest of the day. Maybe today wouldn’t be so horrible after all. Quite a few people came for the party and by 5pm, everyone was ready to cut the cake and start dancing. Aaliyah did notice that Kandy was having a nice chat with Sebastian Vanderburg. She would have to ask her about that later. 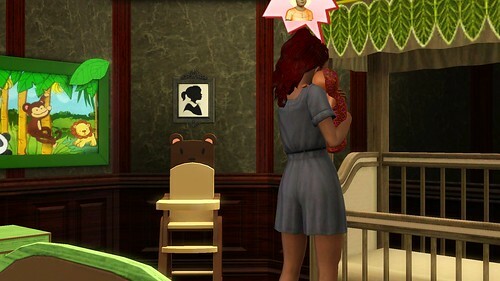 As the party wound down, Aaliyah headed upstairs to go check in on Rae. Although they had cut the cake and everyone had wished Rae a happy birthday, the party was still raging downstairs. As Aaliyah walked into Rae’s room, she heard her father’s voice. “’No,’ said Peter, ‘I will not give you my candy. I will not give you my pen, and I will not give you my lunch.’” Adejola sat on the bed, reading a bedtime story to Rae. Aaliyah smiled, recognizing the book, Peter and the Big Mean Bully. It was a favorite of her dad’s and he used to read it to her as a child. Even with all the important people downstairs, her father still took the time to read to his granddaughter. Closing the door quietly behind her, Aaliyah left them to it and headed upstairs to her own bed. It had been an exhausting day and her belly and her feet were both ready to call it a night. The next day, Aaliyah and Antonio decided to take Rae out for a picnic. They were set to head back to France for the opening of the old nectary that Antonio transformed into a garden house for the town. The day was beautiful and there was an impromptu performance at the outdoor stage. By the time the performance was over, it was getting late and Aaliyah could see that Rae was nodding off. Aaliyah packed her family in the car and got into the passenger seat. As Antonio started the car, Rae seemed to get her second wind and started fidgeting with her car seat. Trying to calm her down, Aaliyah turned around in her seat to talk to her and sing one of her favorite French songs with her. They were only a few feet away from home when Aaliyah looked up through the rearview mirror and saw the car. Aaliyah came to with a gasp. There was a low pressure in her belly and her head hurt. She heard someone calling her but it sounded distant. She felt herself being carried and wondered why it hurt so much to even open her eyes. She felt a jarring impact as whoever was carrying her stumble and the pain that caused was so severe that when darkness came, she sank back into it with relief. When she gained consciousness again, she was in a hospital bed. She ached all over and when she tried to move she felt a sharp pain in her stomach. In a panic, she clutched her belly. Something was wrong. A shadow passed over her and she stared until she could focus on the face. It was her mother. “Hi baby, how are you feeling? Do you want some water?” Ijeoma asked softly. “What happened, where’s Antonio?” Aaliyah tried to sit up but her body screamed in protest, so she lay back down. “Everything is going to be fine sweetheart. You need to rest now and get your strength up so you can come home.” Her mother pressed a red button by the bed and Aaliyah started to feel woozy. She did feel a little tired and resting sounded like a good idea. The third time Aaliyah awoke, Antonio was sitting by the side of her bed, reading softly from a book. Aaliyah tried to say hello, but it came out as a croak. Antonio looked up and closed the book. “You want some water,” He asked softly. “Hey yourself.” Antonio brushed some hair out of her face. “How long have I been in this hospital?” Aaliyah grabbed his hand and held it in hers. He was so cold! Aaliyah couldn’t hear Antonio after that because someone started screaming. It took her a moment to realize that the sound of utter despair was coming from her. Nurses ran in and she could feel arms around her – probably Antonio’s – she did not care. One of the nurses injected something into her IV and soon she could feel darkness creeping onto the edges of her consciousness. She threw herself at the oblivion, happy to escape the pain that had burst from her chest. Aaliyah spent a few days in a constant state of sedation. Any time the medication wore off, she would dissolve into fits of uncontrollable sobbing. Eventually she managed to pull herself together long enough to go visit her new daughter at the NICU. The baby was doing well and soon the nurses expected her to try to breastfeed. Knowing that she needed to get off the medication if she wanted to feed her child, Aaliyah refused all medicine after that point. She was not going to let anything happen to her baby because she could not get a grip! Her father visited her and the baby every day in the hospital. In fact, whenever she went down to the NICU, he was already there, giving her child the love she could not bring herself to give. Aaliyah decided to name the baby Adeya, after her father. Over the next few days, Aaliyah spent her days sleeping on Rae’s bed and having nightmares of the car accident. 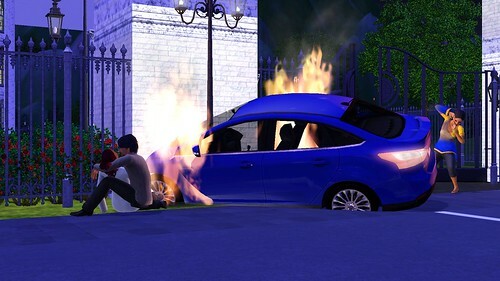 Her memories were still fragmented and she didn’t remember anything about the actual crash, but she was plagued with dreams about Rae’s final moments while that car burned up. Ijeoma and Adejola organized the memorial service and Kandy would sit with Aaliyah while she mourned, even Darling would come and wake Aaliyah up to make sure she got up during the day. Antonio was conspicuously absent through all this. Aaliyah would have been hurt that he wasn’t around if she could get herself to care about anything. The only thing that kept her going now was Adeya. She got up in the mornings for her, lived for her alone, otherwise, she truly believed she would lie down and die from grief. The day of the memorial service came and it seemed as if the entire world was there to grieve with Aaliyah and her family – they got there early and they kept coming. Aaliyah pulled herself together long enough to get dressed and meet the family in the sitting room. As she reached the top of the stairs, she saw Antonio leaning on the stair railing, looking up at her. Aaliyah hadn’t realized how much she missed him until that very moment. She wanted to be angry at him for not being there when she needed him, but realized that she had shut everyone out, including her husband. When she reached the foyer, he held his hand out to her and she stepped close and wrapped her arms around him. She felt instantly less alone. Everything she needed to get past this moment had been right here, if only she had turned to him. She felt so foolish. When they reached the room where Rae’s ashes were on display, Aaliyah felt her knees give out suddenly. Antonio caught her and helped her over to a chair in the corner. “Do you want some water?” Antonio stood in front of her, blocking the view of any curious eyes that might be in the room. And Aaliyah was sure there were plenty. 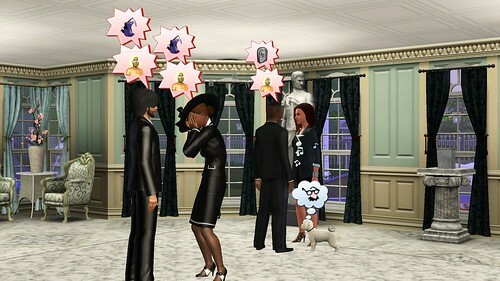 Antonio gave her a gentle kiss and went to greet all the people who had come to pay their respects to the royal family. Aaliyah watched as the dignitaries, the Kings and Queens, Princes and Princesses, and the press filed through one by one to give their condolences to her parents and to Antonio. They would have spoken to her as well, but Antonio calmly told them whatever he needed to keep them away from her. When the room emptied out around midnight, Aaliyah stood up and went over to what remained of her daughter. Aaliyah could not finish her sentence and had to turn away. Antonio was there; ready to hold her until she calmed down. Oh. My. Goodness. Fantastic chapter but heartbreaking. I can’t imagine how it would feel to lose a child. I actually teared up while reading this. On a plus side that car accident scene was awesome and it turned out really well, even though it was so sad. I cried while I wrote it but it was essential to the story. Rae had to die. It took me forever to get through that chapter! Thank you. I don’t know what I was doing, but it did come out great. I second what klb said. However, as I just told a friend yesterday when we were talking about mommies and babies; you can have more children, you can’t have more mothers. Well written and heart-wrenching. Poor poor family. I’m pretty sure I’d murder my husband if he pulled me out of the car before our kids, though. *cries some more* Not little Rae!